Is 8BET a Scam or Legit? Read Reviews! How confident would be playing a site that states in their Terms of Service, it is operating as a BETA site. 8BET.io says just this – so service could be interrupted and they want your feedback on any issues. This is an online lottery provider that has its own games and uses Bitcoin versus other currencies. They have three lottery games and two scratchie games at this point to bet on. There are three lottery games at 8BET.io. Their “Free Crypto Lotto” is played every 8 hours. You can pick a free ticket either using your favorite numbers from 1 to 49 or quick pic. If you match all six, win 1,000 mBTC or US$ 638 (today). There are five prize categories down to match 2. Their “Revolution Lotto” (played daily at 18:00 UTC) and “People’s One” (played daily at 6:00 UTC) costs with the same prize tier. Revolution Lotto costs .50 mBTC with a jackpot currently at 5459.21 mBTC or US$ 35,308.86. People’s One costs .20 mBTC with a fairly similar prize structure. The jackpot rolls over increasing by 21% of stakes/bets made. 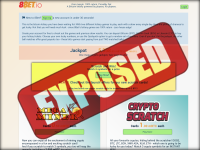 8BET.io also offers two scratch games – “Mega Miner” and “Crypto Scratch”. Both offer pretty good odds. Buy multiple scratch cards and 8BET.io offers discounts including 8 Mega Miner cards of 20% off, 10 at 30%, 10% off Crypto Scratch for 10 cards, and then a combo of both that offers 50%. As a reminder, a scratch game simply means if you match 3 of symbols, you win a prize. One of the things that are interesting (or strange) at 8BET.io is the fact that the “staker” gets a kickback if the jackpot isn’t won. The total amount that is put aside for the players is 10% of the ticket sales allotted against the percentage you paid in. Winnings at 8BET.io are in mBTC. mBTC stands for mili bitcoin. This means it is one-thousandth of a bitcoin or 0.001 BTC. Change that into USD (which I tend to do most of my playing in) and we’re talking 6 cents – today. Bitcoin bounces around in value. And remember, there are no taxes involved as bitcoin is not actually registered anywhere – though you might have to think about that if you’re spending your winnings. Who Can Play at 8BET.io? The only rules and regulations on betting on lotteries at 8BET.io are you’ve got to be 18 years or older. There are no other limitations. There are only three electronic ways to ask questions to 8BET – through email, Telegram, and Reddit. They do get back to you by email very quickly and the answers are clear. There is no information on who they are, where they are except the .io which indicates the domain is registered in the British Indian Ocean Territory. Page Advisor says they are hosted in the US with access through GoDaddy. Through most of the official websites that assess sites, they all say there isn’t enough information yet. Would you mind rating 8BET.io? Excluding the fact they say this is a BETA site and the fact it is fairly young, there are no indications that you are aren’t going to get your winnings playing here. The jackpots aren’t at any mega jackpot level but again, it’s new and there is the potential to grow. 8BET.io doesn’t get a thumb’s up or a thumb’s down. I’d like to see what happens over the next year to see how they operate and more feedback from people who are playing – and winning.